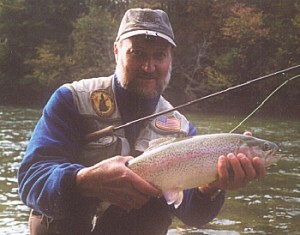 Although a native of Germany, most of Hermann's years have been spent in the USA, where he started fly fishing in Michigan and New Hampshire. Currently living in Germany, most of his angling is now in Austria, where he prefers to fish for rainbows, browns, and grayling, with bamboo and dries. Herm periodically returns to the States to fish with his American buddies. Yesterday I fished the Ager, a fine trout stream over in Austria. The section that my buddy and I fished in the afternoon had changed since the severe flooding in August. On the fishable side of the river, you used to be able to wade out at least a little way all along the shore. But now about half of the stretch, along the lower half of the run, was deep, over your waders, and flowed right up to the undercut bank, which was about three feet over the water. Standing on this bank and looking down, I noticed a couple of rises close in among the countless drifting leaves, including what appeared to be the rise of a pretty good fish. I tied on a dry and cast it right from the bank, without getting into the water. I picked up a couple of bows, about 12" and 14", but I was not sure if either of those had caused the mighty rise I had seen earlier. Soon all was still among the leaves. Since there were no more rises, I found a place slightly above this area where I could get into the water and I changed my rig to a Serendipty nymph, small split shot, and a strike-indicator. Wouldn't you know it, just then a good rise occurred again, in the spot I had just left. Apparently I had missed this fish before. Yet as I didn't feel like changing back to a dry, I set the indicator at a shallow depth, cast downstream, gave a little slack to the line, and let my fly drift into the target zone. When the "bobber" went down, I pulled up and realized immediately that I was onto a bigger trout. The fish tore off across the river, I brought her back, she made another couple of half runs, and I finally brought her in. She was too big for my little catch & release net, but I was able to pick her up briefly for a quick photo and measurement by my buddy, who fortunately had come to see what the ruckus was about. The fish was a beautiful rainbow hen of exactly 51 cm (20"). As I held the fish in the water to get my fly out before releasing her, I noticed another fly, a bead head, on the other side of her mouth. Obviously, this gal had been around the block. Unfortunately, I was clumsy at trying to remove the flies: she gave a thrash, snapped my fly, and slipped away with both flies - now tokens of past battles. The Serendipity was tied with brown z-lon. I used to tie them small, sizes 16-18. If I'm not mistaken, these are supposed to be chironimid patterns. 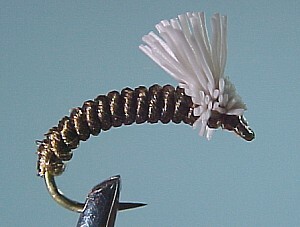 But lately I've also been tying 14s, and yesterday's adventure showed me that this larger size can work too. I've really become a believer in Serendipities, originally in Montana and then on my home waters as well. And (though this may sound like I won an academy award *G*) I really want to thank Fred Bridge for turning me on to these patterns.